Robotics for Kids and Teens (Advanced) is a computer science and engineering course that is based latest software and latest Internet of things (IOT) hardware to build cool robotics and automation projects. Such projects are very interesting for kids and teens. Devices used include, micro-controllers and mini computers such Raspberry Pi, Arduino, ESP8266, Teensy and array of sensors such as cameras, infrared sensors, ultrasonic sensors, accelerometers, gyroscopic sensors and many more. Students are taught object oriented programming in this level. All the code they write in this level is object-oriented. It is important to note that all these concepts are taught in a meaningful project-based way. For instance, students learn object-oriented programming by completing a game project that is a complicated task to do only with functions but is made very easy by using object-oriented programming. Thus, students are made aware of the need of object-oriented programming and how and when one can use it. Similarly, multithreading is taught by having a robot perform two actions at the same time. Meanwhile, sockets are taught by creating a multi-user chat system using TKinter. In addition to this, students get to learn about the concepts of database and SQL, which is the standard language for relational database management systems. 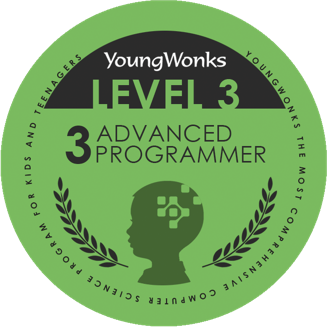 This coding and engineering course is offered as an online coding and engineering class that you attend from the comfort of your home and is also offered as an in-person class at the YoungWonks Coding School facility. Completion of this level will equip students to take on professional level projects and book a berth in the category of advanced programmers.